There are plenty of snazzy-looking third-party keyboards you can install on your Android phone, but for the most part, I’ve stuck with the tried and true “stock” Android keypad. But while the old Android keyboard has some nifty tricks up its sleeves (such as swipe-to-type Gesture Typing), the keypad itself is…well, pretty ugly. Here’s the thing, though: you can, if you like, go ahead and change the theme of the standard Android keyboard, and a couple of just-added themes are quite modern and eye-catching. 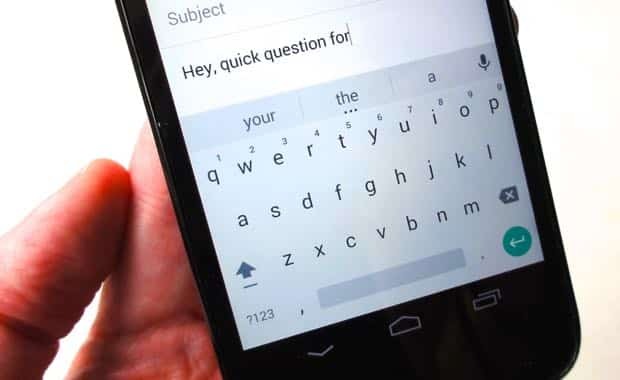 First, make sure you’ve installed Google Keyboard from the Play store. You can grab it right here. Next, tap Settings, Language & Input, make sure Google Keyboard option (under the “Keyboard & Input Methods” heading”) is checked, then tap the little Settings icon right next to it. Tap “Appearance & layouts,” then Theme. Now, back out of Settings and try composing a new message in Gmail—and when you do, get a load of the newer, flatter keypad. Not happy with the change? You can always retrace your steps and pick either the Holo White or Holo Blue options, or try a completely new keyboard from the Play store. Note: The latest version of Android—version 5.0, a.k.a. “Lollipop”—is making its way to an Android phone near you, and I’ll be cranking out tips once I get the update on my devices.